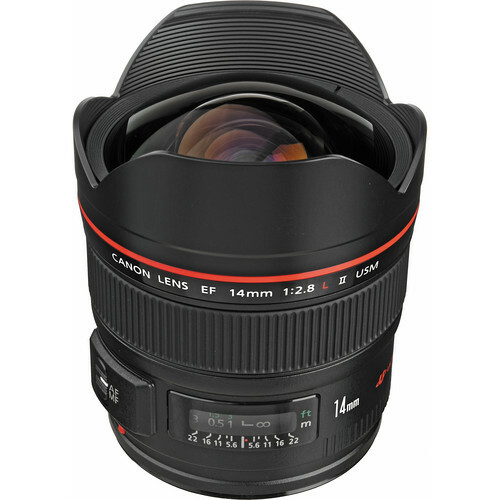 An impressive ultra wide-angle prime, the EF 14mm f/2.8L II USM is a Canon L-series lens well-suited for landscape, nature, and interior photography applications. Its relatively bright f/2.8 maximum aperture is well-suited to working in difficult lighting conditions and also makes this lens an ideal choice for astrophotography. The optical design incorporates two aspherical elements and two ultra-low dispersion elements to control both spherical and chromatic aberrations in order to realize a high degree of sharpness, clarity, and color accuracy. A Super Spectra coating has also been applied to suppress flare and ghosting for increased contrast and color fidelity when working in backlit and harsh lighting conditions. A ring-type USM and internal focusing mechanism also afford quick, quiet, and accurate autofocus performance, as well as full-time manual focus override. Additionally, this lens is weather-sealed for use in trying climates. Ultra wide-angle 14mm prime is compatible with full-frame Canon EF-mount DSLRs, as well as APS-C-sized models where it will provide a 22.4mm equivalent focal length range. Lens's design accepts rear insert-type gelatin filters, which are cut-to-size and inserted behind the rear lens element. EF 14mm f/2.8L II USM Lens is rated 4.8 out of 5 by 163. Rated 3 out of 5 by HangGlider from Disappointed I rented this lens a couple of times before deciding to make the purchase. When I received the lens, I spent the time to adjust the microfocus on my 5D Mk II - and then I took the lens to Canyonlands National Park in Utah for some serious landscape work. I shot with it mounted on a tripod, mirror lockup, remote shutter release. The resulting images are sharp in the center, and horribly soft on the edges. Thinking the issue was that I was shooting at f/8, I did some experimenting and shot at f/22, f/16, f/8, and f/4. The only shots that come close to "good" focus were taken at f/22. Perhaps I have a bad copy of this lens - but so far it's a major disappointment. Rated 5 out of 5 by Everet from One sweet lens! I've been doing interior and exterior architecture shots lately. My widest lens was the 24-70, but I needed a wider view and hopefully a sharper image. I ordered the 14mm on a Thursday afternoon. It arrived the next morning and I had a job that afternoon. Wow! first time looking through the lens was crazy! I did the entire shoot with this lens, processed the results and ended up with enough new work to pay for the lens and make a profit as well. Love the lens. Use it on every job. One caution is rain or snow. Due to the wide angle there is no protection of the glass from the elements. Expect water drops on your lens if you don't take precautions. Rated 5 out of 5 by EOS4me from Big bucks but worth it For architectural and interior shooters with full frame bodies this lens will be a staple right next to the EF 15 2.8. Much improved for digital bodies in the corners with less vignetting and chromatic abberation. Heavy and easy to damage though not usually a problem on a tripod. Really expensive upgrade for what you get IMO as the old EF 14 2.8L USM was O.K. on film but really not a particularly great lens on a digial body. For digital you almost have to have the mkII version unless you are willing to carefully correct the chromatic abberations in LR or CS4. Pricey but if you have to shoot wide there is nothing else to compete with it for a full frame Canon digital body. Rated 5 out of 5 by Jay from Sharpest Image Ever I purchased this lens in 2008 based on Canon's reputation and my personal experience with a wide range of canon fixed focal lenses that I had purchased over the years. The pictures I took with this lens were so sharp, it changed my understanding of lenses altogether. Case in point, I took a picture of the night sky in Canada on oct 21, 2011. the settings were f/2.8, 15 seconds, ISO 2000. I noticed a cluster of stars at the edge of the image. When I zoomed in it turned out to be the Pleiades constellation. I could actually see all seven sisters. I am so happy with this lens, the next one will be the 17mm f/4L TS-E. Rated 5 out of 5 by RichF from Great glass ... my new favorite lens I was at first hesitant to buy this lens given its cost, thinking that my 17-40 f4 was sufficient. After reading some other reviews, however, and talking to a veteran photographer at the store, I bit the bullet and I'm glad I did. It takes a little work getting used to a lens this wide in terms of the horizontal plane and focus -- but once you do, the results are fantastic. It's very sharp, particularly at the wider apertures, with no distortion. Color rendition is dead-on. Even though I bought the lens primarily for landscapes, I find myself using it all the time. With a lens that wide, you can capture people/scenes with them unaware that they are a subject of the shot. Rated 5 out of 5 by balu from SHould you buy? Buy - buy -buy, I never made a better decision, this thing is just a mind blower, you will explore possibilites you never thought you would.It will change your world of photography in a massive way.Performance is amazing, picture quality is just wow, don't believe all the BS you read, are there bad copies out there ? - I am sure, but when was your last new car perfect? While this lens is rather way expensive, keep in mind it's tough to loose more than $500 even after years of usage, so how much this thing really will cost you? Built like a tank, performs like the sharpest knife, and it is truly pleasing even to look at. Rated 5 out of 5 by sonfollower from a whole new way of looking at things Just got this lens. I will use it of all kinds of work, but it will be a great asset in my commercial work especially real estate photography. Just completed a shoot of 5 condo units on the beaches of South Walton County FL. Absolutely awesome lens. I was able to get panoramic views of small spaces, creating photographs with great appeal. Potential purchasors will feel they have been in the unit. No distortion at all if you get the shot set up correctly. I was even able work in hand held mode for most of my shots. Looking at the work in Capture One V7 and the image clarity, color, and POP is all I could want! Rated 4 out of 5 by Sproesser from Fantastic viewing angle I really want to give this lens 5 stars, but it's corner sharpness is just not good enough for a perfect score. It's not as sharp as some other Canon prime lenses, but it's more difficult to make a super sharp lens at such a wide angle. It's still sharper than the 16-35mm L. Everything else about this lens as fantastic. It's one of my favorite lenses. I just love the viewing angle, it's superb. It's around 100-110 degrees across, and has little to no distortion. This means if you shoot with the camera level, a horizontal line will be perfectly straight. Shoot perpendicular to a horizontal line, and it will be straight. You can show and entire room from a corner, plus a little of each wall you are standing near. If you are a fan of wide angle this is a must try lens. I need a ND filter for this lens.Any suggestions ? There is a flexible filter holder attached to the back of this lens. You slide a flexable Kodak filter you cut to size into the frame. I'm looking at this lens for Milky Way photography. How is the barrel distortion on this compared to the Rokinon 14mm f/2.8, which I have and like, except for that distortion? Dave, I have/had both lenses and prefer the Canon 14mm overall, although I have not specifically compared barrel distortion. Bought the Rokinon for northern lights photography in Norway and Sweden. The Rokinon distortion wasn't a problem for me as the whole NL photo scene is pretty wild as is. As you know, the Canon 14mm is big $$, so would hope it will have more use than the Milky Way. These days my kit is basically the 14mm, 24-70mm and 100-400mm, on a 1dX MII body. Answered by: Charles H D.
Yes, that lens is very wide angle and has very little if any distortion. 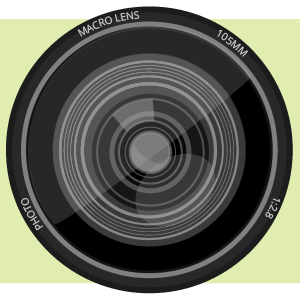 It is an excellent lens for interiors and small rooms. Which Sensor works best with this 14MM Lens, a APS-C CMOS or a Full Frame CMOS? Asked by: Donald G D.
If you want the full benefit of this 14mm Ultra Wideangle lens, than I recommend using a full frame DSLR. If you opt for an APS-C sized sensor camera, you will probably be seeing the equivelent of about 20mm. I understand there is no front thread for a filter, but does anyone have an idea what size the front could be, AND also what the rear filter size is? Thank you for your responses thus far. Though I read that this lens has a gel filter holder at the rear of the lens. What size would I need to cut the gel filter to should I use that option? Also, I inquired about the front thread size should I decide to hold filter in front of it and wondered which 77/82/95/100mm might work. Thoughts/ideas? Im interested in using this 14mm lens for night photography and wide-angle macro. Has anyone tried using this lens with a 12mm extension tube for wide-angle macro? Im wondering if thats even possible. Thanks! Unfortunately, the Canon Super Wide Angle EF 14mm f/2.8L II USM Autofocus Lens does not have a front filter thread. It has a Gel filter holder at the rear of the lens. I want to use this lens for night photography of stars &amp; sky. Does this lens have coma? Asked by: DAVID H C.
I have used this lens on multiple occasions for night photography including stars and milky way. I have not noticed any discernable coma issues with it.